What difference does 1% make? 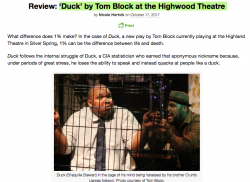 In the case of Duck, a new play by Tom Block currently playing at the Highland Theatre in Silver Spring, 1% can be the difference between life and death. Duck follows the internal struggle of Duck, a CIA statistician who earned that eponymous nickname because, under periods of great stress, he loses the ability to speak and instead quacks at people like a duck. Over the course of the 60-minute one act, Duck wrestles with his involvement in two deaths. The first death – of a suspected Middle Eastern terrorist – was carried out after Duck determined the man was 60% likely to carry out an act of violence against the United States. (Duck later admits that he rounded up from 59%, not knowing that 60% was the threshold the CIA used to approve executions.) The second death is that of his father, who, in the early stages of Alzheimer’s, had asked Duck to sign a right-to-die document that allowed the hospital to euthanize him when his disease became severe. As we watch Duck unravel under the burden of his guilt, the central tenet of the play is clear: To what extent does Duck believe himself complicit in these deaths even though he did not carry them out with his own hands? And how can he come to terms with his role in these deaths? The show is successfully framed through a series of flashbacks, during which Duck’s brother Crumb (James Nelson) acts as a sort of “ghost of Christmas past,” allowing Duck to revisit key moments in his past that have brought him to this point of crisis. Shaquille Stewart is convincing as the unhinged Duck as he tries to reconcile the fact that some consider him a hero and others a villain. Clare Shaffer’s crisp and well-paced direction keep the play moving seamlessly and the lighting (E-Hui Woo) and sound design (Drew Moberley) add depth and intrigue to the show. Duck raises interesting questions of universal relatability: We may think we are prepared to follow orders, but are we able to live with the consequences of those decisions?